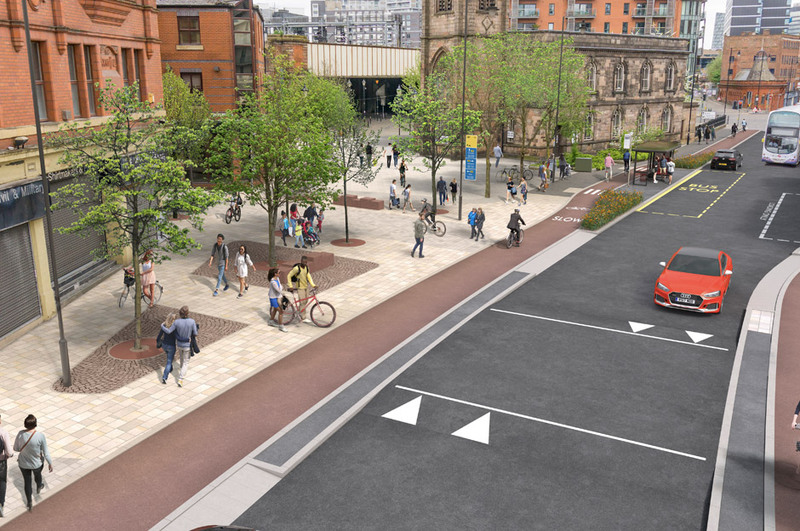 Manchester has announced a major £500million scheme that will make walking and cycling realistic alternatives to using a car - increasing health and fitness while tackling the city's congestion and pollution issues. Named 'Beelines', invoking the city's worker bee symbol, the initiative will create over 1,000 miles of routes across Greater Manchester including 75 miles of segregated cycling lanes and cycling-friendly 'filtered' neighbourhoods, like those in the Netherlands. Announced today by former Olympic gold medal-winning cyclist Chris Boardman and Mayor of Greater Manchester Andy Burnham, work is expected to begin on what will be the UK's largest joined-up network by the end of the year. It will be finished by 2023 if 10 local authorities agree to the plans. According to a survey by Transport for Greater Manchester (TfGM), only 2% of children cycle to school every day, compared to 50% in the Netherlands. Each year around 250 million car journeys of less than one kilometre are made in Greater Manchester; journeys which would take just five minutes to cycle or 15 minutes to walk. Burnham said: "This proposal is bold and I make no apology for that. If we are to cut congestion and clean up our air, decisive action is needed." Boardman, who is Greater Manchester’s Cycling and Walking Commissioner, said: “We have seen from other global cities that these methods work and the benefits are there for all to see. We simply can’t afford to be left behind. “Planners, engineers and most importantly, local people in each district led on creating the first draft of these plans, which will evolve in the months and years ahead."